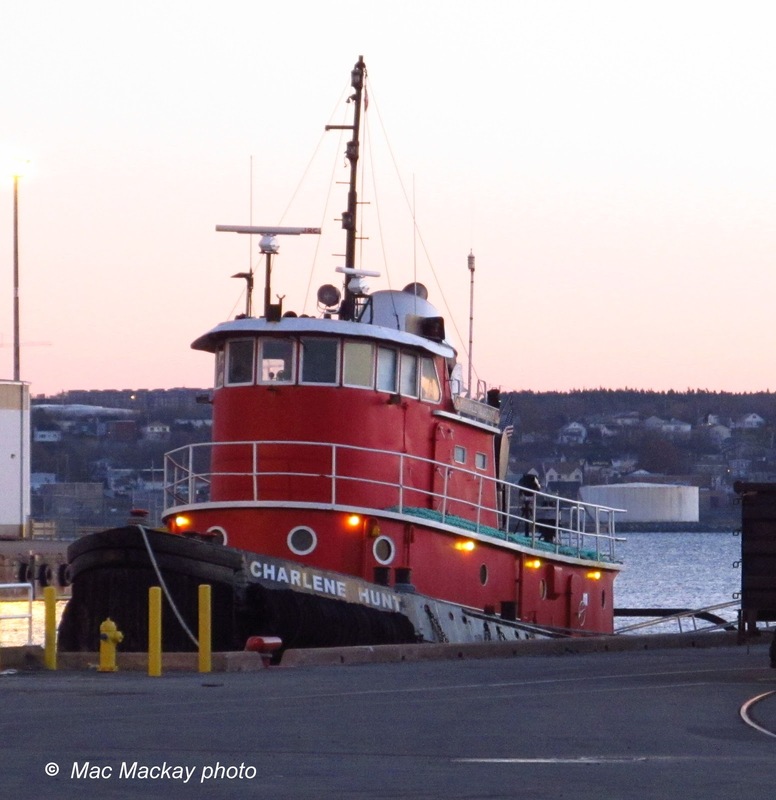 The venerable US flag tug Charlene Hunt arrived in Halifax yesterday for an unexpected visit. 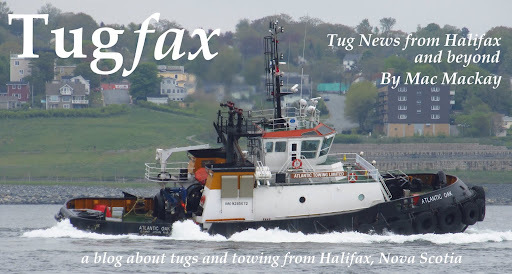 On its way to St.John's, NL, the tug put in to Halifax, probably to escape fierce winds and high seas, and maybe to seek a calm spot to effect some repairs. There was no sign of life aboard at sunrise this morning, but I will keep an eye open today. It has had numerous names and owners over the years. It started life as Colonial later becoming HR 1. It then did a stint as Morania No.24 for the well known New York tank barge operators (now named Penn Maritime), moving on to the Staten Island operator Turecamo Bros as Betty Jean Turecamo. (Turecamo has since merged into Moran). 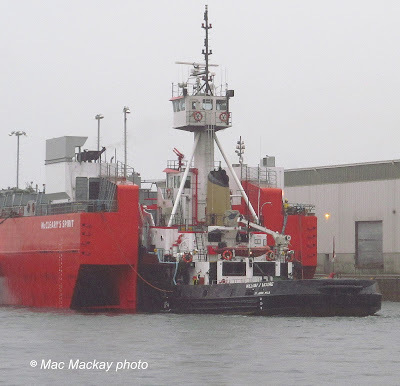 In 1993 it became Anna V. McKay and in 1996 it became Bay State Towing's Molly. When the Boston area Bay State morphed into Constellation Maritime in 2005 it was renamed Orion. In 2006 it moved on to its present owners, Hunt Marine I LLC of Narragansett, RI and became Charlene Hunt. As posted last year, http://tugfaxblogspotcom.blogspot.ca/2011/07/salvanguard-iii-new-generation.html, Semco Salvage and Marine of Singapore has had three Salvanguard's in its fleet. 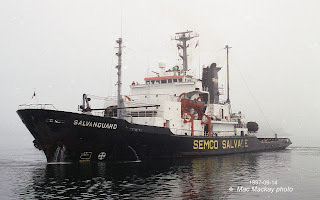 I have delved into the shoebox for more on Salvanguard (ii) built in 1978 for the Tokyo Salvage Company. Semco acquired it in 1987 and ran it until 1998 as a salvage and towing tug. Of 2,938 gross tons, it was fitted with two 6 cylinder MAN engines (built under license by Kawaski Heavy Industries) delivering 12,000 bhp through two controllable pitch props in nozzles. The tug was also fitted with two towing winches, a 5t bollard pull bowthruster, a 36 tonne deck crane and had 26 berths for ship's crew and salvors. It was also fitted with fire fighting and salvage pumps and could deliver steam. 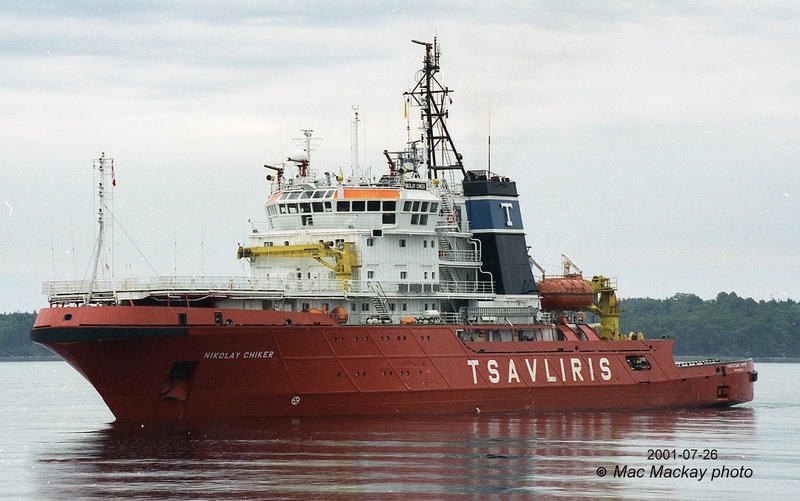 Its 1997 visit to Halifax was initially towing the oil rig Spirit of Columbus to Quebec City, stopping in Halifax so that the rig's thrusters could be removed, to reduce draft. The tow to Quebec City was marred somewhat by engine trouble on Salvanguard, meaning that the Quebec tugs had to do most of the towing work. 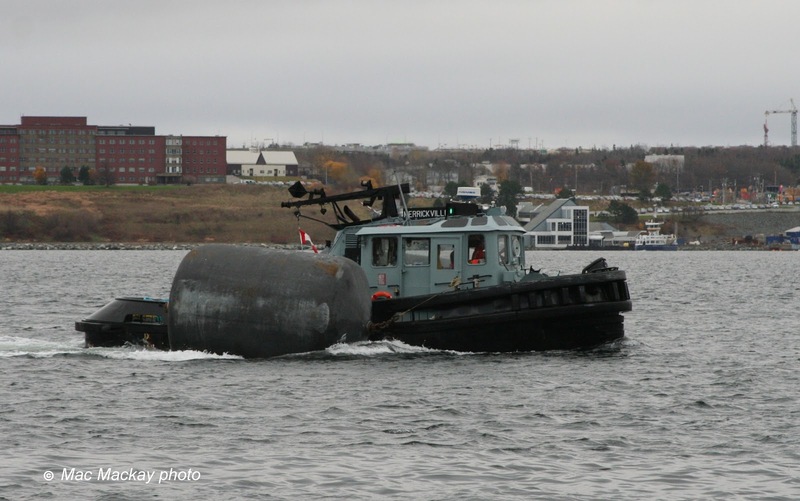 The tug returned to Halifax for engine work for ten days in September before heading to St.John's, NL. 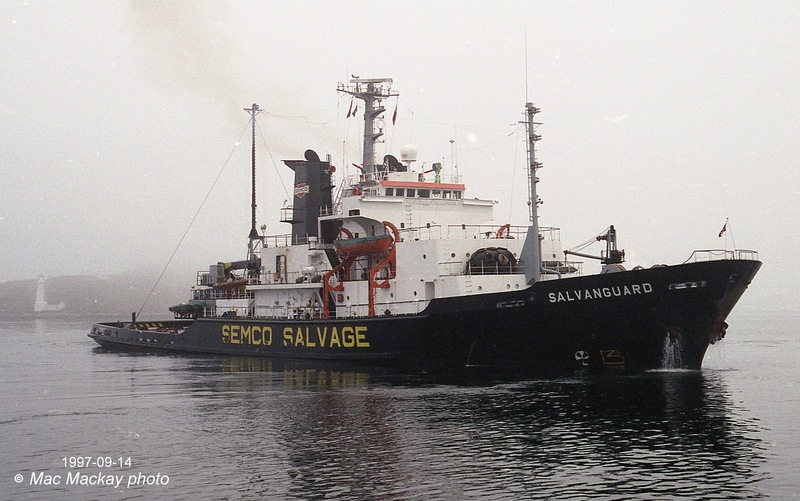 Semco sold the tug soon after and it is now working as a North Sea research ship and named Geobay. It flies the Isle of Man flag, but is owned in Norway by DOF Subsea. 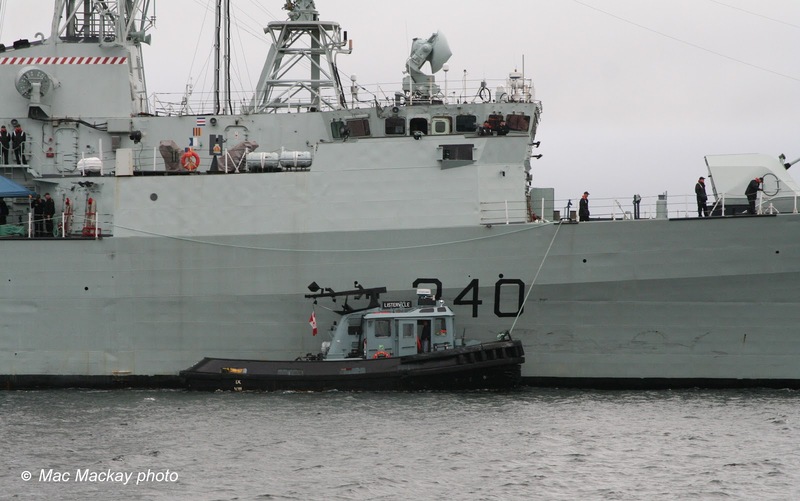 Canada's navy tugs are crewed by civilians, and operated by the Queen's Harbour Master. 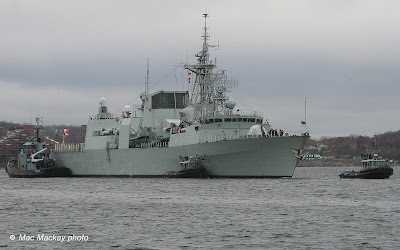 As Canadian Navy (Forces?) Auxiliary Vessels they are dedicated to navy work. 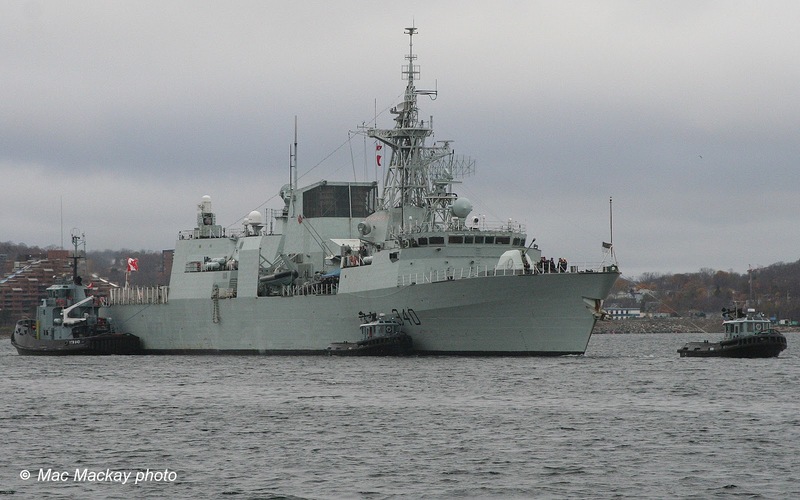 This morning they were at work moving HMCS St.John's from HMC Dockyard to pier 21. Later in the morning other Dockyard small craft placed a containment boom around the ship. 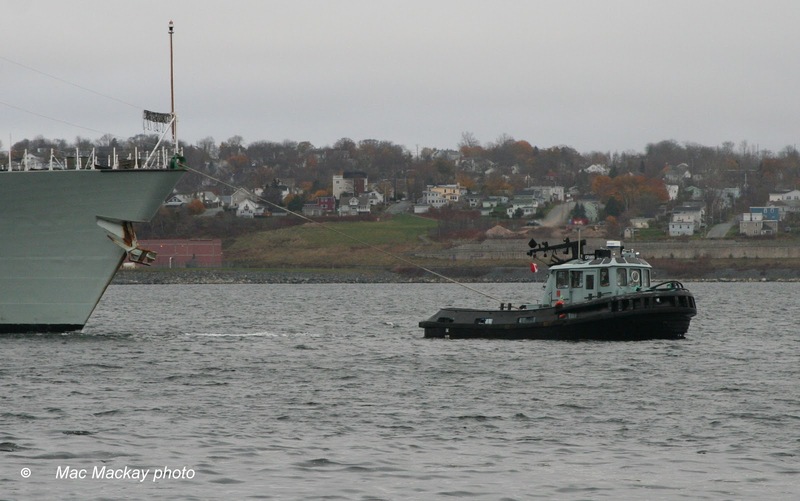 Meanwhile the tug Glenside was inbound towing HMCS Shawinigan from refit in Shelburne, NS. After many months of layup the tug William J. Moore and its barge McClearys Spirit arrived in Halifax this morning bound south. Following up on the post of July 28: http://tugfaxblogspotcom.blogspot.ca/2012/07/william-j-moore-end-of-line.html the pair spent the rest of the summer idle in Montreal, Sorel and finally Trois-Rivières before sailing November 7. Still registered in Canada, to K-Sea Canada Corporation, they have been reassigned to work in Curaçao. 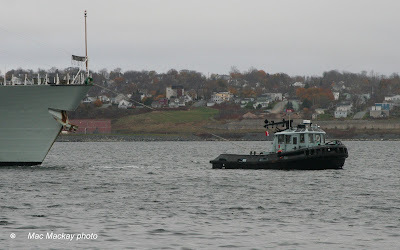 While in Halifax they will likely be reflagged. 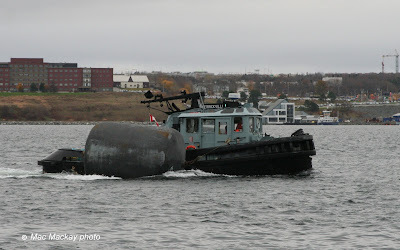 The double hull clean fuel barge and the tug are connected with a quick release Bludworth notch/pad system, which allows independent movement as an articulated tug/barge (ATB). The reason for this move has received considerable comment on Boatnerd and Diesel Duck. I have no inside information, so will only repeat what has already been reported. The barge apparently did not pass its five year survey. The barge was working under charter to Ultramar, and that company preferred to find tankers on the sport market, even if it meant bringing in foreign flagged ships. It could do this because other Canadian flagged tankers were not available. Both tug and barge have long histories, although they were extensively rebuilt in 2002. Perhaps their age had more to do with the situation than anything else. K-Sea Canada is an offshoot of the US K-Sea Corp which was taken over by another large operator in 2001, Kirby Corp, and is now one of, if not the largest tug/barge operator in the US. On Friday November 16, the tug and barge sailed from Halifax, still flying the Canadian flag, and giving Freeport, Bahamas as its destination. 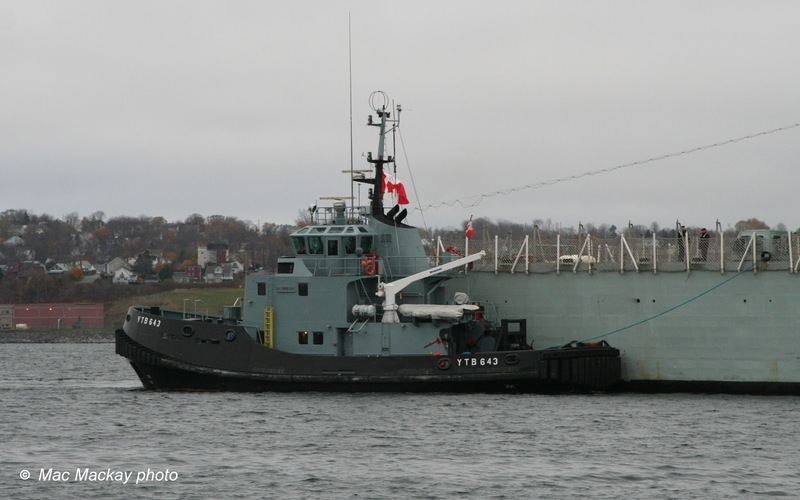 Of note, V-Ships Canada appears to be managing the tug/barge. They also manage CSL ships among many others world-wide. The supplier Intrepid Sea (ex Sable Sea-02, Neftegaz 29-98) left port under cover of darkness tonight in tow of Atlantic Elm. 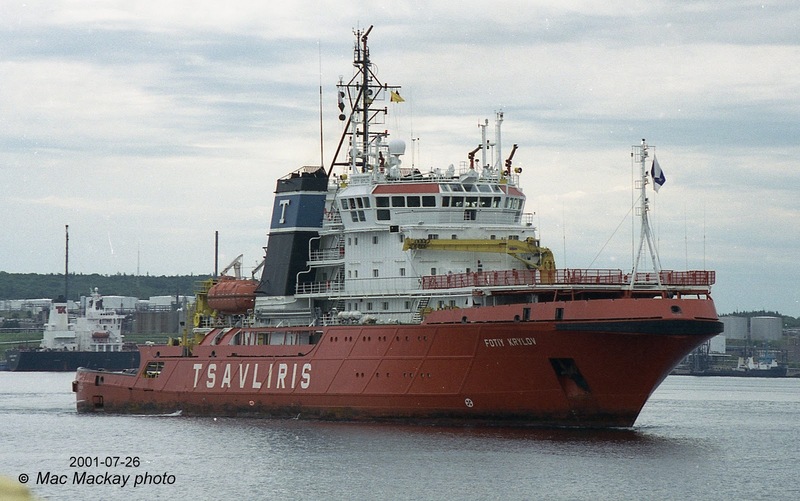 The former Russian supplier had been idle in Halifax since arriving here in tow November 15, 2001. 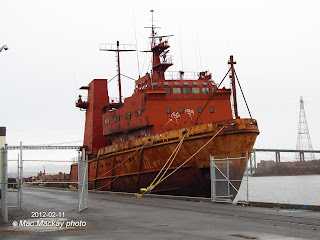 Various parts had been cannibalized to assist in the conversion and repair of former fleet mates in the Secunda fleet, and the ship had been moved around to various locations in the port. It had been laid up most recently at Pier 9A. In May of this year its Canadian registry was closed and it has since been referred to as N-29. Whether it is registered at present it is hard to know since it flies no flag nor displays any port of registry. Its history has been given here before, so will not be repeated, but it is apparent that with the recent buyout of McDermott Canada Ltd by local management, the ship had no future with Secunda. The ship's destination was given as Boston, with an arrival date of November 13. Once in Boston, it is my assumption that it will be handed over to a US tug for onward towage to its final destination for scrap, likely Brownsville, TX. Departure from pier 9A was assisted by Atlantic Larch. As the ship was moving off the dock part of its port deck rail gave way and the bits the tug was using parted company with the ship, in the bight of the Larch's line. The bits later dropped into the water in the main channel. 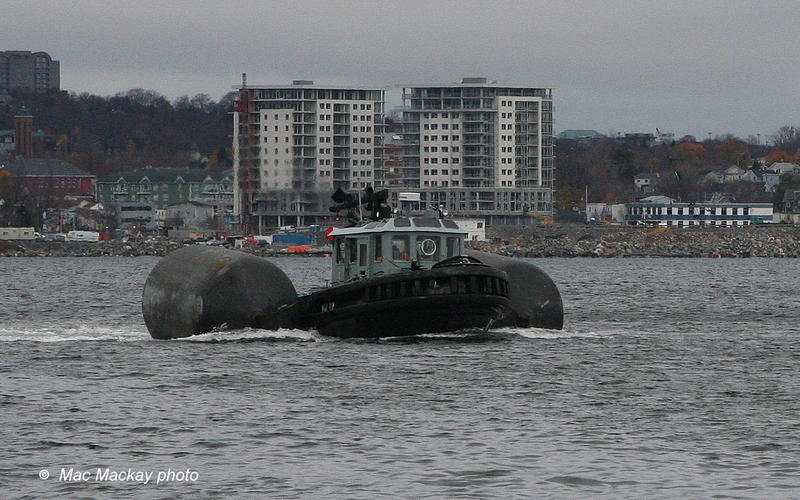 Also the supplier had some old Rigid Hull Inflatable Boats (RHIBs) on deck and possibly some other scrap material. 1. and 2. 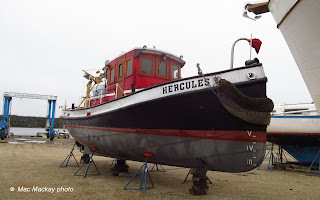 Hercules awaits a return to salt water on Mahone Bay. Her mast has been laid flat for road transport. 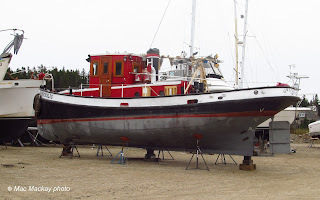 A tug, built in 1945, and for many years in fresh water near Montreal has returned to Nova Scotia. Built at Owen Sound, ON by Russel Bros as the Listerville for the Canadian navy, it was one of scores of Ville class "pup" tugs built for use at naval installations all over Canada. As 45 foot, 165 bhp tugs they became jacks of all trades, pushing, towing, and running errands around dockyards and naval bases.They were easily transportable by rail and so ended up in many out of the way places over the years. Listerville was based in Halifax for many years. After disposal by the navy it worked for McKeil Workboats as Cavalier and its register was closed in 1999 when it became a pleasure craft. It was carefully refitted and renovated and renamed Hercules It arrived back Nova Scotia on November 8 by truck and will soon enter the waters of Mahone Bay. A second Listerville is currently in service at HMC Dockyard in Halifax, it was built in 1974. 3. Listerville in naval service in the 1950s in Halifax harbour. The prominent smoke jack from the forecastle stove was a trademark of the pup tugs. Holding the title as world’s most powerful tug(s) for a time, it was the Russians again. The two Finnish built tug/icebreakers, Nikolay Chiker and Fotiy Krylov are indeed impressive ships. 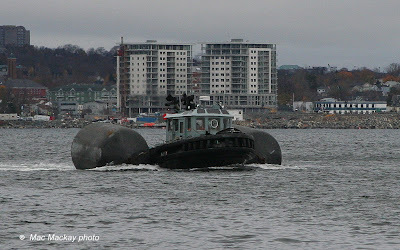 Produced by Hollming Oy in Rauma in 1989, with four Wartsila main engines producing 24,480 bhp these tugs have an advertised bollard pull of 250 tonnes. They are also fitted to support divers, have helicopter landing pads, firefighting (and drenching) systems and extra accommodation for 51 crew and 21 supernumaries to support salvage or rescue operations in remote locations. They are ice class and can work in temperatures to -25 degrees C.
Owned by Sovfracht, they were operated by Tsavliris Russ, a sort of joint venture with Tsavliris Towing & Salvage of Greece/London. 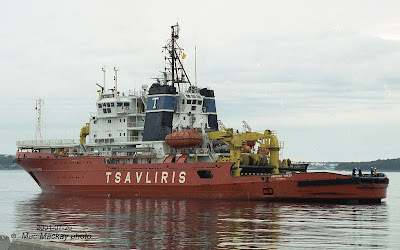 There was considerable dispute at one time over ownership of Fotiy Krylov, when the ship was sold to Tsvalirtis by one Russian agency and contested by the Russian government. 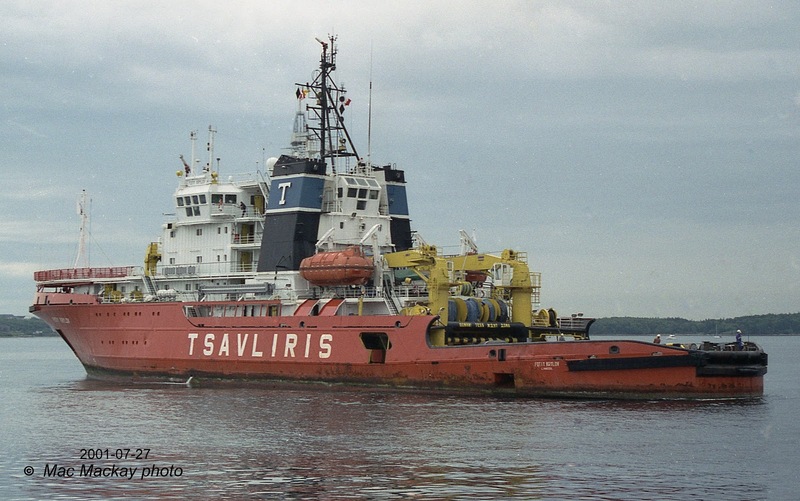 The tug was renamed Tsavliris Giant , but in the end the Russian government won, the name reverted but continued with the charter arrangement. Absent from these tugs are the huge derricks that the previous large tugs carried. Powerful hydraulic knuckle boom cranes replaced the derricks. 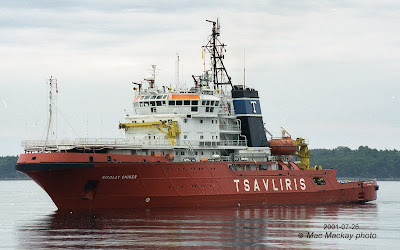 The two tugs were in Halifax arrived in Halifax July 26, 2001 towing the drilling rig Eirik Raude from Pascagoula. Since that time the Nikolay Chiker has reverted to Russian naval control, and Fotiy Krylov is on charter to Tsavliris.